What Can I Do with Q-Logic 3? The Q-Logic 3 Advanced Drive Controls System for power wheelchairs is standard with Bluetooth®, allowing you to program your Q-Logic 3 to operate your smart device if it is Bluetooth enabled. Use Q-Logic 3 Bluetooth programming to pair your power chair with a variety of devices. This allows you to operate your smart phone or tablet using your Q-Logic 3 screen. Use Q-Logic 3 to search for your smart device, and then enable Bluetooth on your smart phone, tablet or desktop computer. Q-Logic 3 pairs with the device, allowing you to operate your device using the joystick on Q-Logic 3. Q-Logic 3 can operate a wide range of appliances that use infrared (IR) remote controls. Use Q-Logic 3 in conjunction with the optional Q-Logic 3 EX Enhanced Display, which has built-in environmental controls. Use ECON-I on your iPad® or ECON-W on your Windows® desktop to program each household device. Using Enhanced Display, Q-Logic 3 learns each “signal” of each command from the household device. For example, if programming a window fan so it can be operated via Enhanced Display, each function of the fan, such as on, off, speed and change direction, has a unique signal. Select the specific function on your Q-Logic 3 EX Enhanced Display and Q-Logic 3 will communicate the signal to the household device. Programming manuals for Bluetooth and IR environment controls are coming soon. 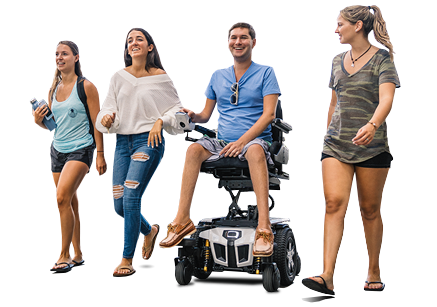 Q-Logic 3 is available on the 4Front®, Q6 Edge® 2.0 and the Q6 Edge® HD power chairs. Call 1-833-QiLevel (745-3835) to talk to one of our associates today!